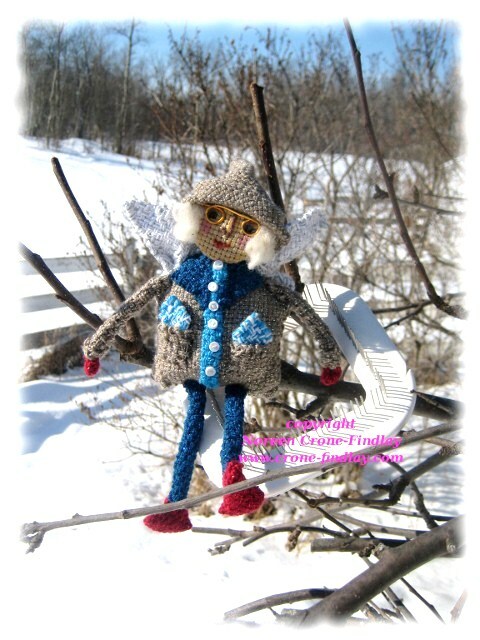 Tottie Tomato looked outside the studio window and saw someone tobogganing on the snowbanks…. She astonished Tottie by fluttering up into the tree….. and Tottie realized that the fluttery little person was a fairy! 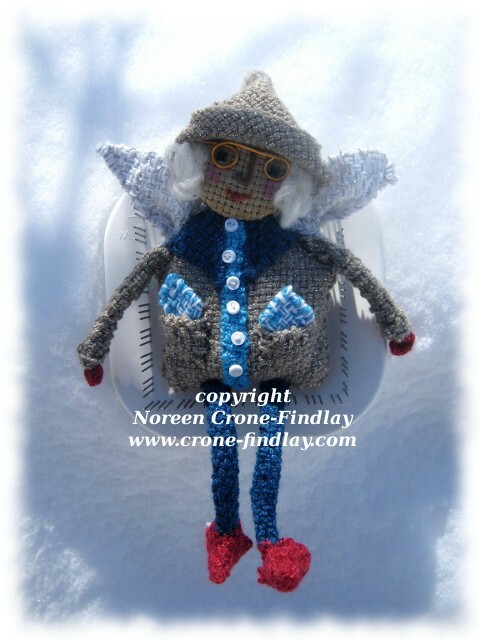 The fairy looked awfully familiar…..
Tottie Tomato saw that she was shivering- it was so cold! 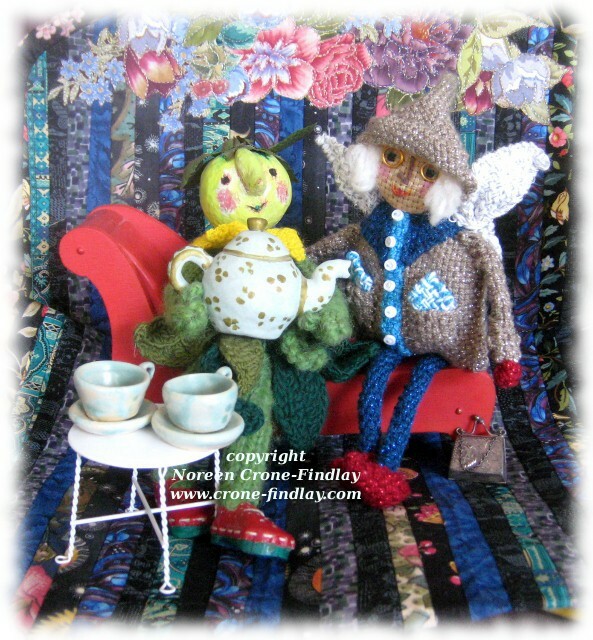 So, she invited the Winter Fairy in for a cup of tea…. Tottie Tomato had been watching the progress of the Winter Fairy coming to life, so she was surprised to see her outside! Winter Fairy said that she felt that, once she had her wings, she really ought to see what Winter was all about. Sledding was fun – but chilly. The Winter Fairy told Tottie Tomato that she prefers to experience winter from the warm side of the window, so she has decided to take up permanent residence in the studio and perhaps wait until springtime before venturing outside again. Tottie Tomato is looking forward to many pleasant cups of tea with the Winter Fairy. She plans on showing her around the studio and introducing her to all manner of lovely folks. Tottie Tomato is very happy that I took part in the Zoom Loom Doll Weave Along on Ravelry- otherwise, the Winter Fairy would never have joined us here in the studio! Tottie Tomato is getting anxious…. When are all these piles of little squares and rectangles and triangles going to turn into a doll? There’s another week in the Winter Weave Along on Ravelry, so there’s lots of time…. I have been experimenting with the Schacht Zoom Loom, and figuring out how to weave more shapes with it than just the square it was designed to weave. 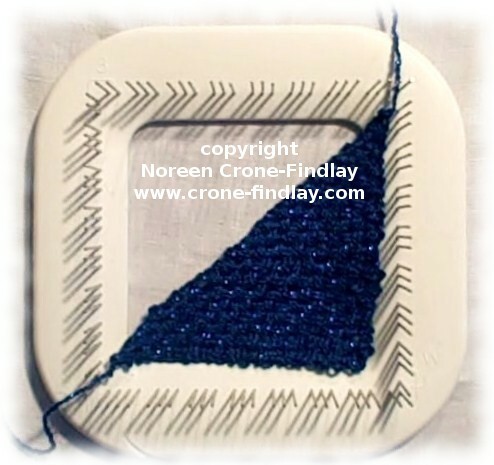 In previous blog posts, I’ve shown how to weave small squares Link and rectangles Link. One of the most important shapes to be able to weave when designing with small looms is the the triangle. And, so, I’ve figured out how to weave perfect triangles on the Zoom Loom. I am always intrigued by figuring out ways of maximizing the potential of small looms. Just because a loom is square, why should it be limited to weaving just squares? Rectangles are important in the design process, too! And, so, I figured it out… and here’s a new video tutorial showing how to weave a rectangle on the Zoom Loom. There are times when you need to have rectangles and narrow strips to finish a design, and now, you can weave them on your Zoom loom. In my previous post, I showed how to weave a tiny square on the Zoom Loom. 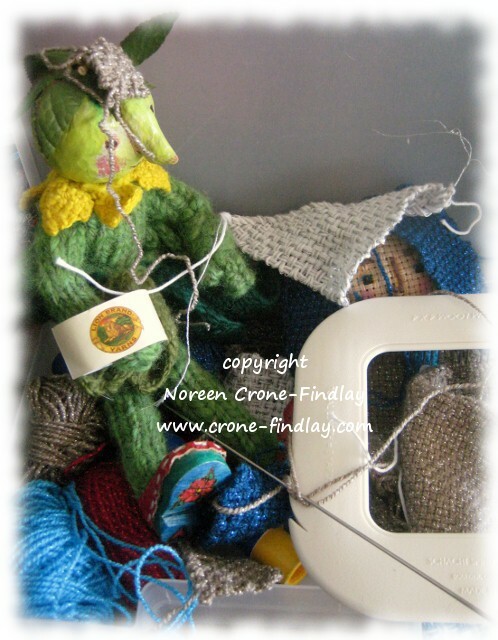 That’s because there’s a fun ‘Weave along’ on the Zoom loom group on Ravelry- all about weaving dolls on the Zoom loom. 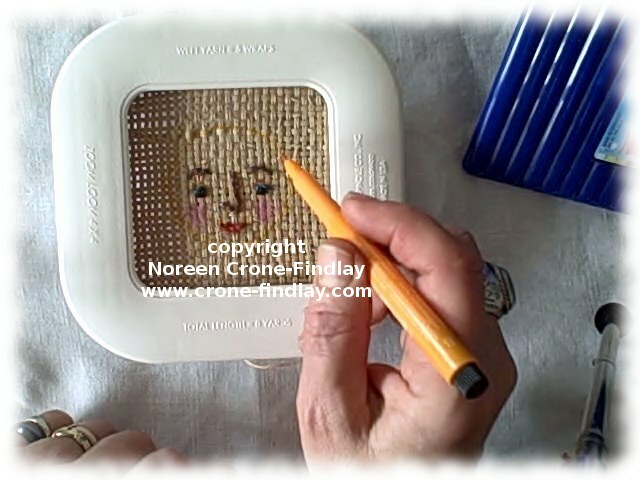 I thought that I would make a little video, offering a few tips about embroidering on the squares that you weave on the Zoom Loom. These tips also work on any other pin style loom or potholder loom, or many of the small looms that are available nowadays. 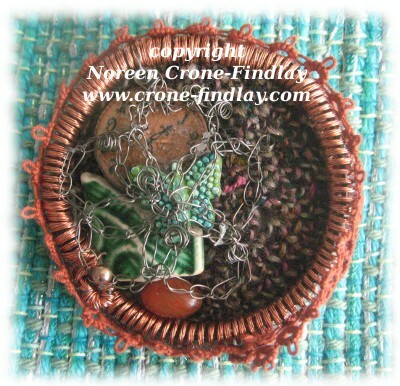 There is an ongoing Weave Along on the Zoom Loom group on Ravelry. 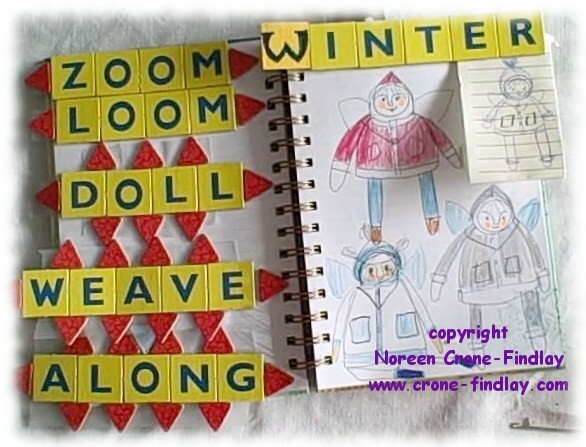 I love weaving dolls, so I was hooked on the idea of weaving one doll for each of the seasons, using the Zoom Loom from Schacht. I sketched my thoughts about the ‘Winter’ doll, and always in all the sketches- pockets showed up. It was essential that my Zoomie doll have pockets. After all… Winter= Cold= Gotta have pockets! So, I had to figure out a way of weaving tiny squares on the Zoom Loom (it’s the Zoom Loom weave along, so no cheating by crocheting or knitting the pockets). 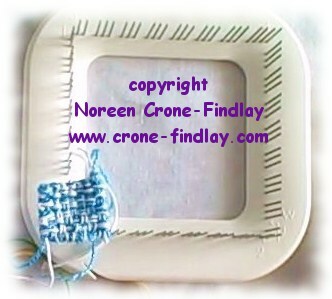 I figured out a nifty way of weaving wee little squares on the Zoom Loom and have made this video showing how to do it. I think that the 4 seasons Zoom Loom Doll Weave Along is going to be great fun. By the way- I love the little Zoom loom and I don’t profit by singing it’s praises. The weave along is going to continue all through out 2014, so do join in. I am just a member of the Ravelry group, and not a moderator or anything, so if you have questions, join the group, and hop right in. 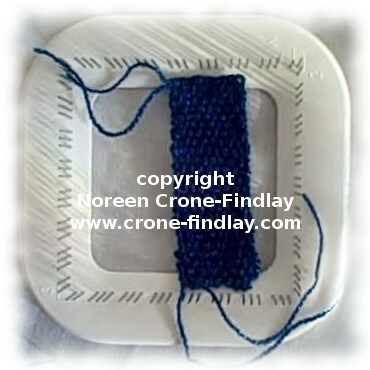 I’ll be posting more tutorials as I make them, showing the unusual ways that I am using the Zoom Loom. Last night, we were at a wonderful birthday party – it was such a pleasure to feel so much love focused on our friend! Jim and I were sitting with friends, basking in the lovely time. One of our friends is a young woman who is a gifted musician. She opened her bottle of Jones soda and read out the ‘fortune cookie’ written inside the bottle lid. It said: “You will be confronted with limitless opportunities”. She contemplated it for a minute and said: ‘Confronted with limitless opportunities….. hmmmm’…..
and that began a heartfelt conversation between us…..
‘Confronted’ with limitless opportunities really does speak to the necessity of developing discernment and wisdom, doesn’t it? She is a woman of deep heart and great intelligence – and she is a wisdom seeker. 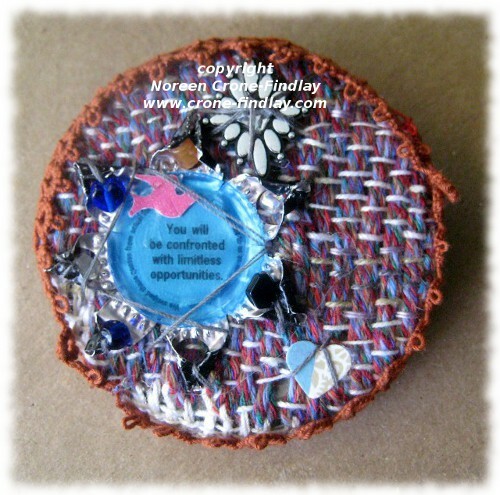 I felt that this small ‘fortune cookie moment’ was filled with significance, so I asked her if I could take the bottle cap and make a brooch for her with it. I spent the morning working on it, and have just finished it. Jordan, my dear, may you be blessed on your journey! and I wish you well, well, well…. 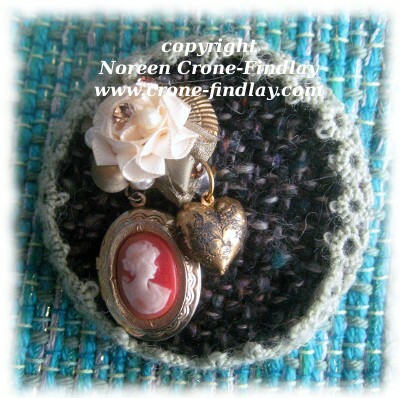 To see how I make these brooches, please go to LINK for the post with instructional video. I love weaving jewelry, and I love upcycling. So, I have combined these loves by using upcycled elements in some really fun Steampunk inspired brooches that I have designed and made. I weave the backgrounds for the brooches with the Schacht Zoom loom (the new version of the classic Weave It loom). 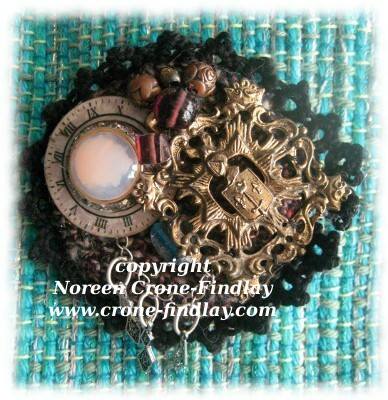 Then, using the lid and base from frozen orange juice cans, I build fab brooches. I combine all kinds of things, like tatting, found objects, various embellishments that I make, as well as crocheted and woven wire. This video shows how I do it.